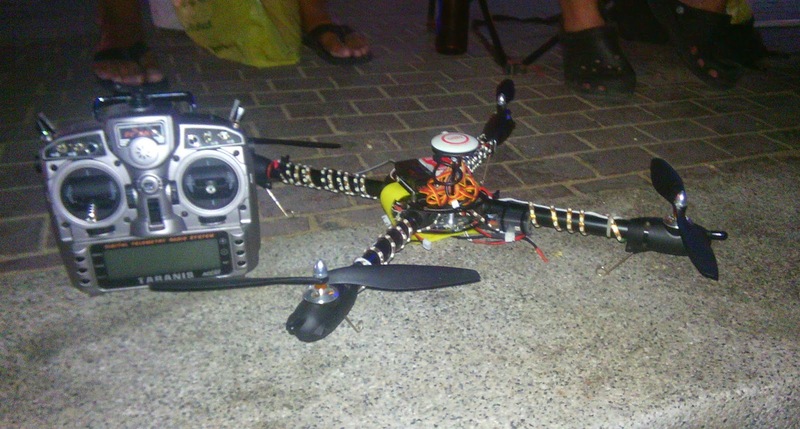 Learn to design, build and repair remote flying devices and see what other RC pilots in Pattaya are up to . We had another gathering of our group of night time beach flyer's last night with me (Scotty), Big Paul, “Paul the Toy Man”, Andy and our entourage of my side kick Ann, Andy's wife and some of our beach bum friends also attended including Raf, Barry, Peter and a few others we know that just dropped by for a chat and watch the show. Andy mentioned he come up with a name for our group. He said we should call ourselves “The Fireflies” as we fly with our lights on as we fly at night, we kind of look like fireflies in the sky. “Paul the toy man” added it should have the word beach or pattaya in the name so for now we will call ourselves “The Pattaya Beach Fireflies”. On this night we had a bit larger than normal number of events with a total of 3 minor crashes, one forced rx failsafe mode landing where a TX radios (the Taranis) battery went dead and at least one cool semi coordinated flight of all four aircrafts flying in the air in patterns without crashing. 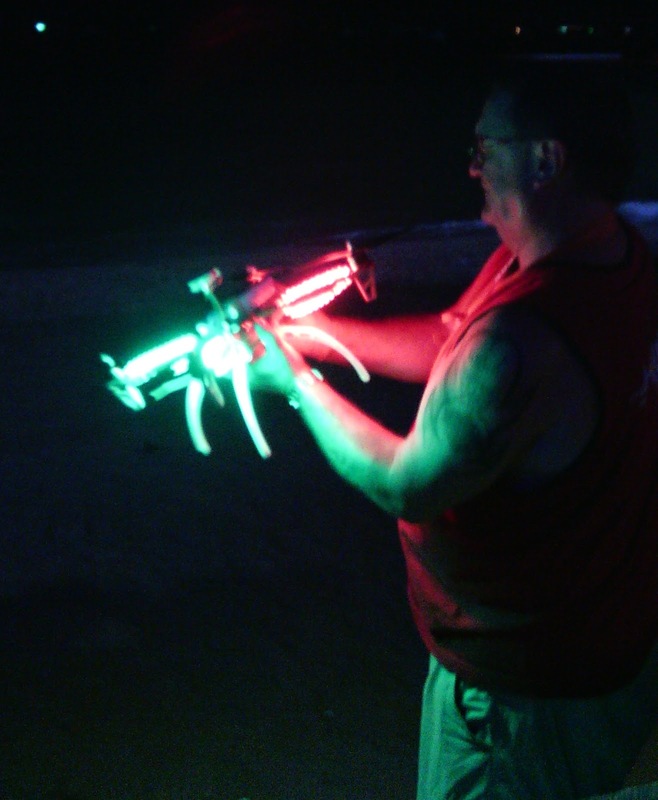 On this night we also had a new virgin Black Gaui quad-copter aircraft to play with that was not fully tested before this night with it's new configurable led lights installed and all working. He said it had to do with having some unexpected people come down the stairs onto the beach as he was flying low altitude that ended up blocking his vision at the wrong moment in time. With this one we just dusted it off and it was back flying again in seconds. The next crash was with Paul the Toy man crashing into the big tree to the right of us, and getting it stuck up there. This time I was watching as he did it when he was deep inside the tree branches doing a stunt he completely took his eyes off the aircraft to turn his head more than 90 degrees to talk to someone. It only took that moment to have the aircraft drift 12 more inches and tangle the blades into the leaves of the tree and crash. So what did we learn from this? “Keep your eyes on the aircraft during flight in stunt modes. don't get distracted by other people when you fly, talk to them AFTER you land”. But I should talk as I was the next and last one to crash the Black Gaui quad-copter on this night, and I did a much better job of it in my crash than Paul did. The last crash was me going full lateral speed of about 20 miles per hour from the right side of the beach and dropping altitude very fast when I started giving opposite thrust to try to stop the aircraft directly in front of us at about 15 feet out. But at the new gain settings at this speed that I had now set at minimum of 80% the aircraft wasn't as responsive as what I had been used to flying just moments before when I had it set at about 137%. So instead of stopping quick in flight it continued to the left off past us and just nicked one prop on the trunk of the coconut tree to the left of us. This put the copter into an unrecoverable spin so I shut down the motors in hopes to minimize damages. The quad ended it's flight upside down in the sand about 8 feet to the left of the coconut tree with no real damage but one prop had spun off in the impact on the sand but was not broken. We were able to locate the prop on the sand but the prop nut was much too small to be located and we gave up after a 10 minute search for it. So that ended our somewhat eventful night of flying and crashing. All the crashes made for some excitement but I think the best flight of the night was when we had all four aircraft in the air at the same time. We had begun to learn to fly patterns together with one pattern that I found fun and cool to watch was to juggle aircrafts where one drops down and under another aircraft and then he would fly up and over with the other aircraft doing the same to make like a juggler juggling balls. We also had a coordinated quick fly up where we would all be near the ground and on a signal would all fly way up at the same time and spin around at the top. We will have to later learn to plan new cool patterns before we fly and figure out some code signal words to signal when a part of a pattern should start or change. It's also one thing to focus on just one other aircraft target other than yourself but with 4 aircraft I have a bit of a problem keeping track of all of them at the same time. So I think its is eventual that we will have a midair at some point if we don't practice and learn to fly together in some orderly manner. I think some cool patterns would also be horizontal circles clockwise then counter clockwise switch on command then maybe a figure 8 pattern clockwise and counter clockwise, then vertical circles much like our juggle mode we do now but with all four aircraft not just two or three as we had going yesterday. with all four aircraft I think it will be a real challenge at the cross point of an 8 pattern so we better take our time on that one when we get a bit better at it. Maybe a mirror flight mode method might work where we each are set to follow just one other aircraft but in a chain so all each pilot needs to do is focus on one target that is his link in the chain. Each aircraft keeps some specified distance behind his target in the chain. The lead of the chain would have to be sure not to drag the chain of aircraft into itself. Just a thought as I'm not sure this idea would really work if we were to try this method of pattern flight.